Go to Soi Sukhumvit 24 please. Go to Sofitel hotel please. In case the taxi driver doesn’t want to use the meter which is not fair! (I never get on a taxi who doesn’t want to do that just for a principle) You should ask him to do so. ช่วย /chûai/ + do something + ได้ไหม /dâai-mái/? Can you use the miter please? Can you stop here please? too bad! The video cannot be watched now. 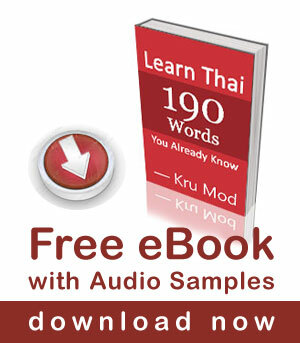 Drivers will often ask me something in Thai when I am travelling long distances (like from Silom to Rama II). My friend said that he is probably asking me if I want to take the toll-way. What should I listen for in this case and how should I respond? I had a “magic string ” tied around my wrist by a tuk tuk driver. 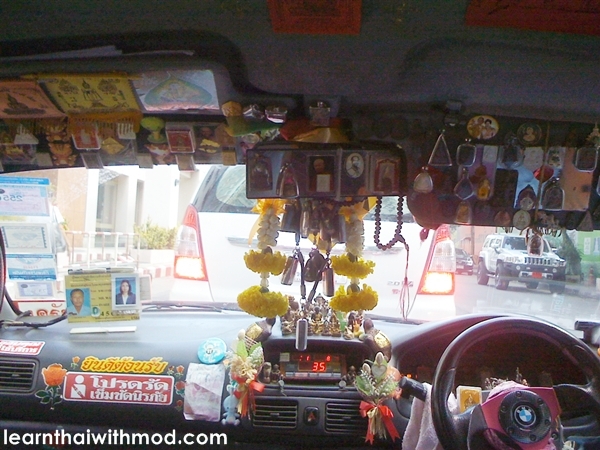 Thailand has to have the absolute most eccentric group of taxi drivers I’ve ever seen. 🙂 Dollar bills folded into cranes, flowers, fans. It was awesome. I’m excited to come back next year.